Even If you have a professional video camera to take Arial video clips is a challenging task. Smart Phones can do everything but clipping accelerometers, GPS systems number was increasing and price reducing. Accelerometers allow Quadcopter to control self-level, GPS tracking. If you would like to Live stream real-time with full HD mode just go for Quadcopter. Arial Filming with Quadcopter is now easy, safe equipment. There many devices like Drones, Quadcopter, Dji’s for live video streaming in Arial view. Quadcopters are budget-friendly and easy to handle it. 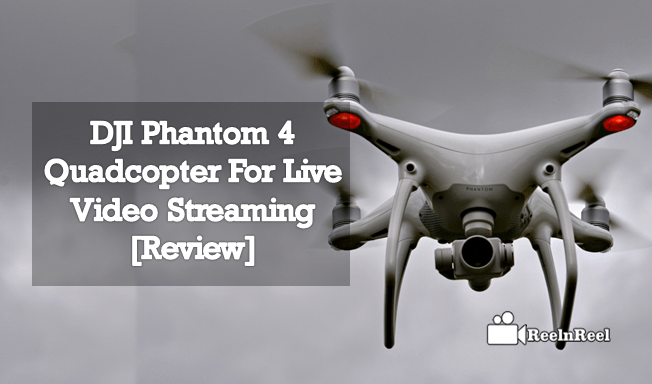 Here we have listed best Quadcopter for live Video streaming, i.e., DJI Phantom 4 Quadcopter. The DJI is the World’s best streaming devices Manufacturer, The First Facebook Video streamed by DJI in areal view. DJI line of market professional drones, Phantom and Quadcopter are leading in the Live Video streaming aerial imagery. DJI introduced high advanced computer vision and advanced Quadcopter Camera platform for Dji consumers with DJI Phantom 4 Quadcopter. It has Gimbal stabilization 4k Videos with 30 fps having a 12 MP camera . Intelligent power management system with it can boost up to 28 minutes of flying time. 4 way obstacle avoidance, it has an option of adding additional , remote control is integrated in tablets, iPhone and iPad. 24mm f/2.8 lens with inch camera gives high quality videos. Auto takeoff and auto return with GPS technology system makes easier. Bird eye view with this drone universal video clarity for Live video streaming. You can create, edit the video built in software technology and share the videos at the same time of editing. having more than one battery gives you spend more time on Phantom 4. If you more number of batteries you should need a battery charger to avoid wastage of time. It gives protection from unexpected take offs and obstacles. It is extremely lightweight and secure. Designed for Micro SD card holders captures HD, 3D and 4k videos. It Supports a minimum of speed 30Mbps. This 16GB SD card will allow you only 30 min of recording . If you buy extra 64GB SD card it better get more time on flying mode. Flight battery which takes an aircraft in flying position to take live videos. Propeller is used to avoid obstacles when you go higher. Already Phantom 4 contained propeller to take care of avoiding obstacles , its is better to have extra props also. Micro USB cable for your smartphone or iPad or iPhones. User Manual for how to arrange all devices and connection, power supply, take off and flying mode instructions. It controls Phantom 4 quadcopter downlink system and remote controller for camera functions. It can handle the body part of the AIrcraft, if it fixed right then you can enjoy it. It has some adjustment according to the height of the body. DJI Phantom 4 is the best flying camera to take aerial view captures and video from Live video streaming. Here is the Guide for DJI Phantom 4 quadcopter use, how it works and all its accessories. You can use this as a reference for DJI Phantom 4.